There is an awesome beauty in old age, in the broken and twisted forms that record a long tough time on earth, and in the life that goes on in spite of it all. 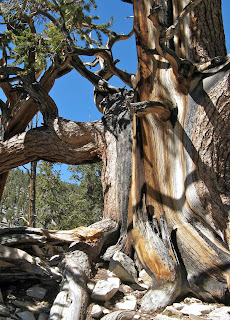 Great Basin bristlecone pine, Pinus longaeva; White Mountains, California. 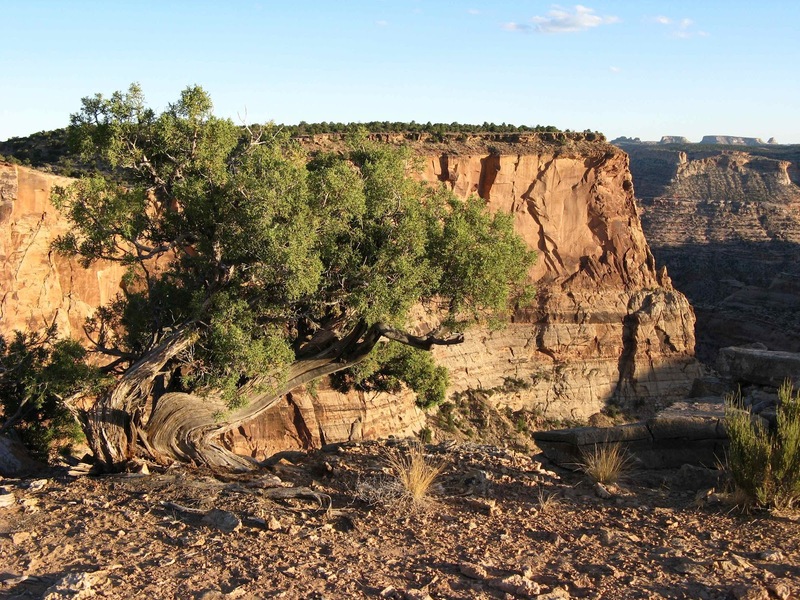 This tree started its life around four thousand years ago, when fortuitous circumstances allowed a tiny seed to germinate and become established amid calcareous rock fragments, little moisture, and scant nutrient-poor soil. Young bristlecones on harsh sites grow slowly, adding an inch or less of girth each century. After five hundred years, the tree would have been in the prime of life, like the one to the left, sporting abundant green branches and fertile cones, and growing with the graceful symmetry of youth. But of course youth doesn't last. 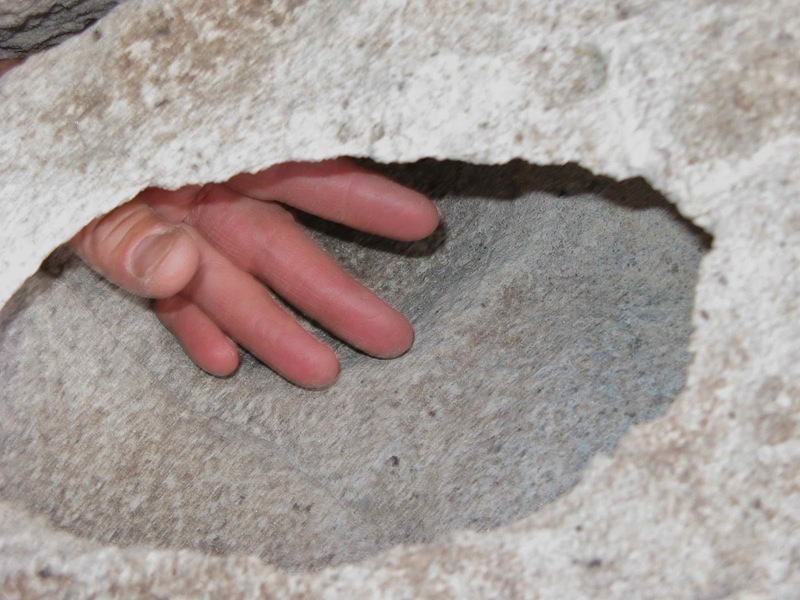 Over the next several thousand years, the trials of life left their mark. The top of the tree was broken off, and a side branch took over. Then the replacement crown itself was lost and replaced, creating a wooden pitchfork. Youthful symmetry was gone. 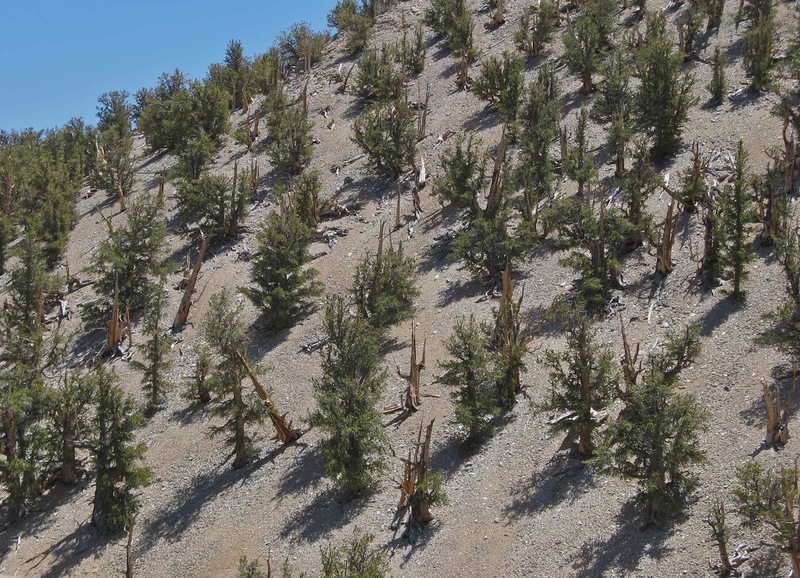 Great Basin bristlecone pines, with distinctive pitchfork growth forms. Roots were exposed and killed by erosion, forcing parts of the tree to give up the ghost -- no more bark, no more needles, no more cones. 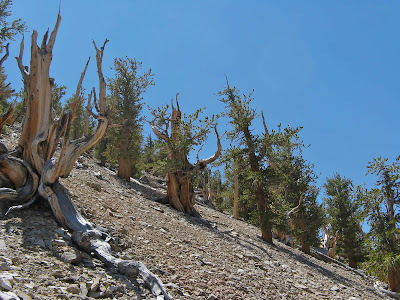 Eventually there were only a couple of narrow winding strips of bark left to carry nutrients and water from the soil skyward, and to transport photosynthesized sugars from the remaining needles. By the time Edmund Schulman arrived in the White Mountains sixty years ago, this tree was pretty much as it is today -- mostly dead. 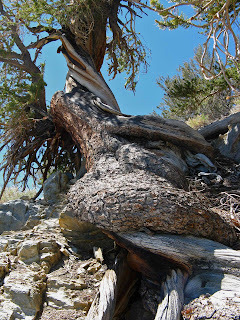 This bristlecone is down to two strips of bark, one on each side of the tree. 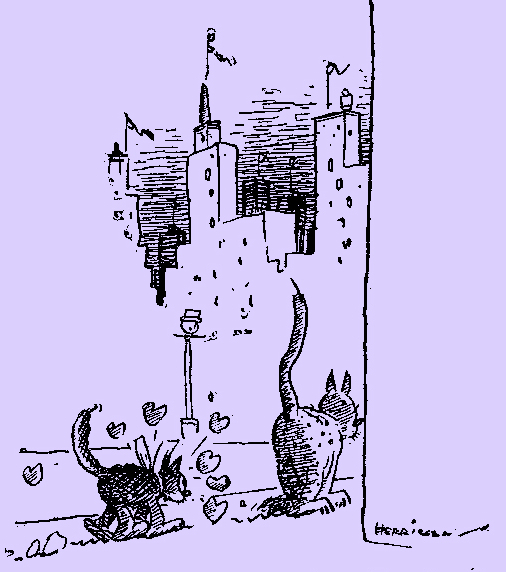 Edmund Schulman called them "life lines". 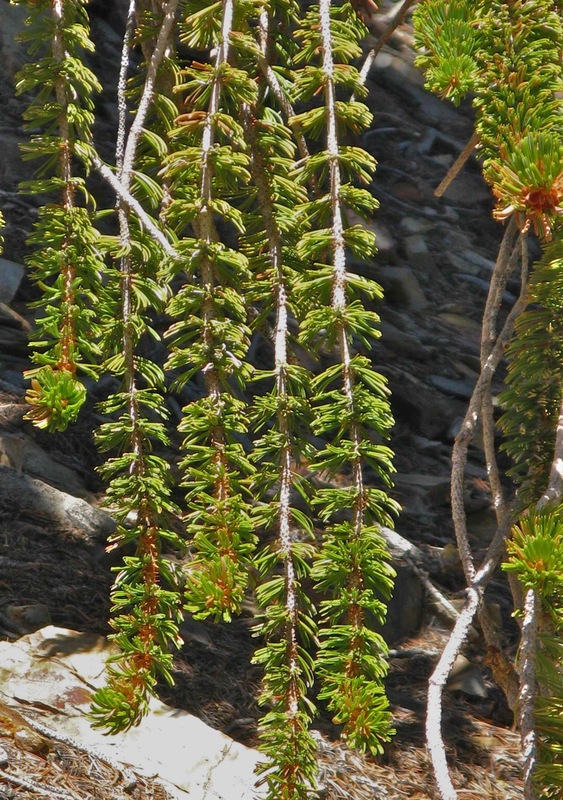 It was Schulman who discovered the longevity of bristlecones in the White Mountains. In 1958, he reported there were 17 over the age of 4000, and the eldest, the Methuselah, was dated at 4600 years. This set off a flurry of research that continues today. 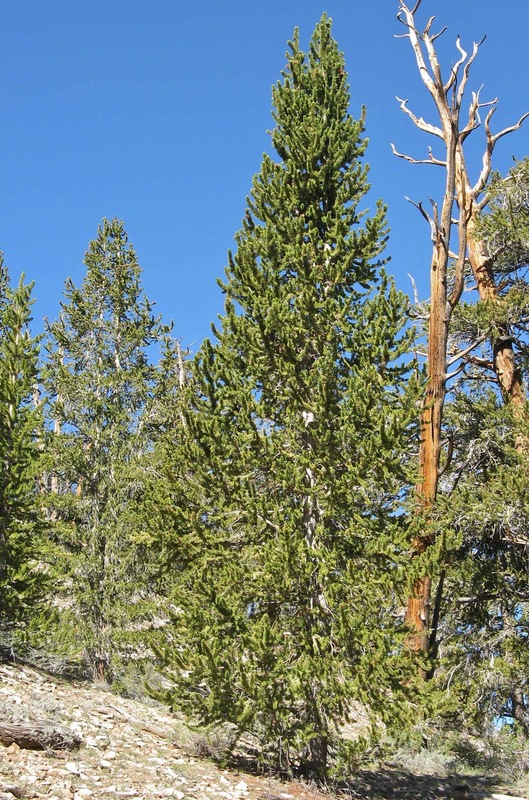 The long-lived bristlecones have provided records of times and climates past, and insight into tree growth, reproduction and adaption to harsh environments. 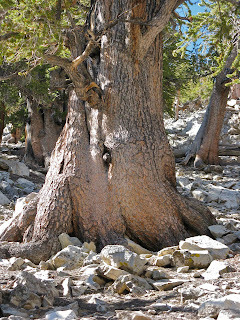 Perhaps the biggest attraction is their promise of the Secret of Long Life, for even though these trees are ancient, they still enjoy the vigor of youth. 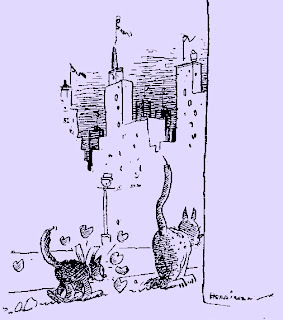 Like Mehitabel the old alley cat, down to just a single life, the ancient bristlecones still live it up. 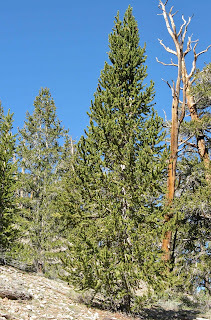 If you follow a winding narrow bark strip skyward to the remaining green branches, you will find not only needles but cones as well -- healthy cones with abundant pollen and viable seed, produced at rates suggestive of the heady days of youth. 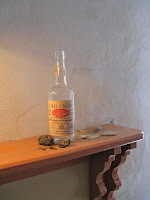 Yes, there’s life in the old dame yet! 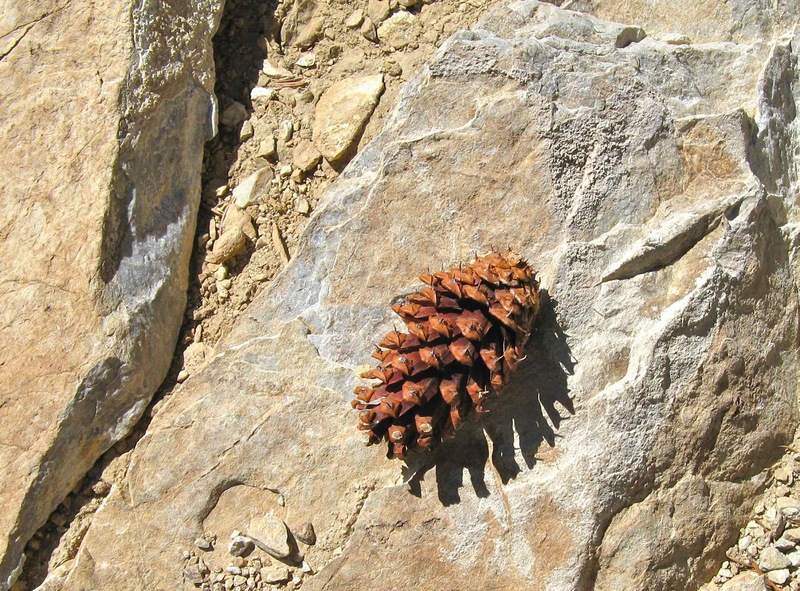 Cone of a bristlecone, 3" long; note the eponymous bristles. Even more impressive -- the oldest trees are the stunted ones on the harshest sites, growing just enough each year to keep a slender strip of bark or two alive, and to produce seed, which with luck the wind will carry to some equally inhospitable site. 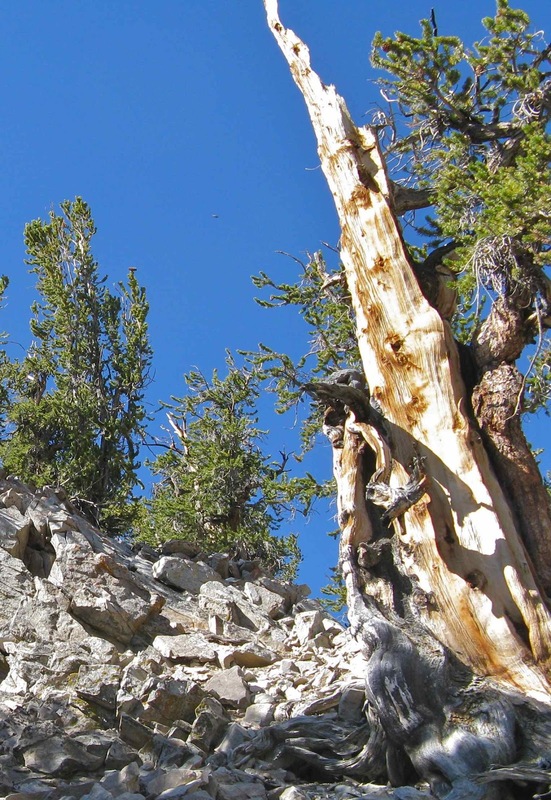 Great Basin bristlecone seems able to thrive on very little. What's the bristlecone’s secret to a long life? The harsh environment in which it lives is part of the answer. 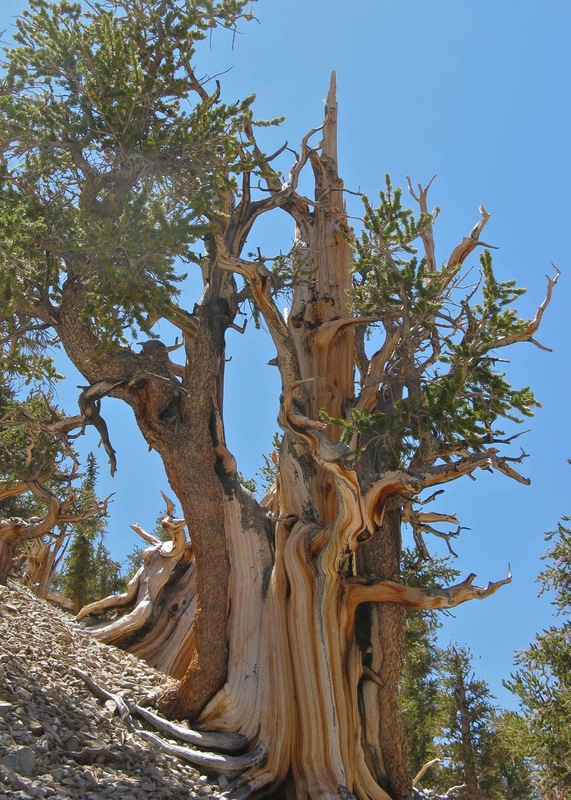 A bristlecone pine can grow quite well on more hospitable sites, but would be out-competed by other plants. 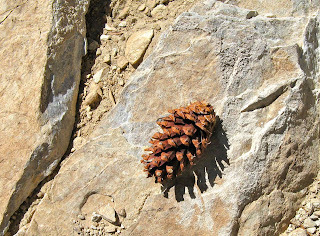 There is little competition on dry rocky nutrient-poor soils at 10,000 feet elevation. The cold dry climate provides other benefits. 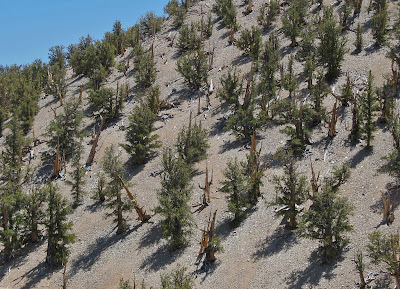 Microbial growth is slow, and agents of rot and decay that plague trees elsewhere pose few threats to most bristlecones. Because plants are scarce and grow slowly, there is little litter on the ground to carry fire between the widely-spaced trees. 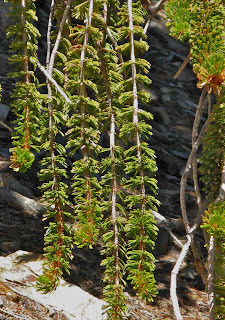 But there must be something about the bristlecones themselves that allows them to survive for many centuries where few other plants can grow. They have quite a few tricks up their sleeve, actually. Here are some of them. 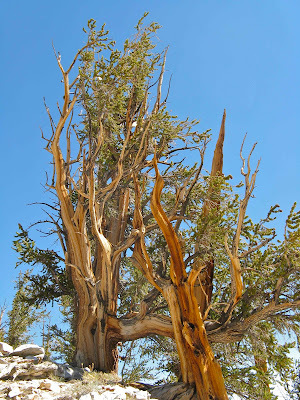 Bristlecone needles stay on the tree 30 to 40 years! New ones are added each growing season, but if there’s a particularly bad year when needle growth isn’t possible, older ones supply carbohydrates 'til things get better. Bristlecone wood is dense and resinous, and highly resistant to rot, especially in a cold dry climate. But it is not entirely immune. 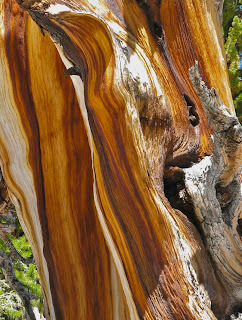 The wonderful colors of dead wood are due in part to invading wood fungi, and chemical interaction between fungi and resin. Even a fallen tree takes a very long time to decay. In the meantime, the wood is sculpted and polished by wind, water and ice. A bristlecone pine is composed of sectors. If the roots of a sector are destroyed, only the tissue of that sector dies. The rest of the tree lives on. Left: sectored architecture and dieback. Finally, bristlecones don’t senesce. 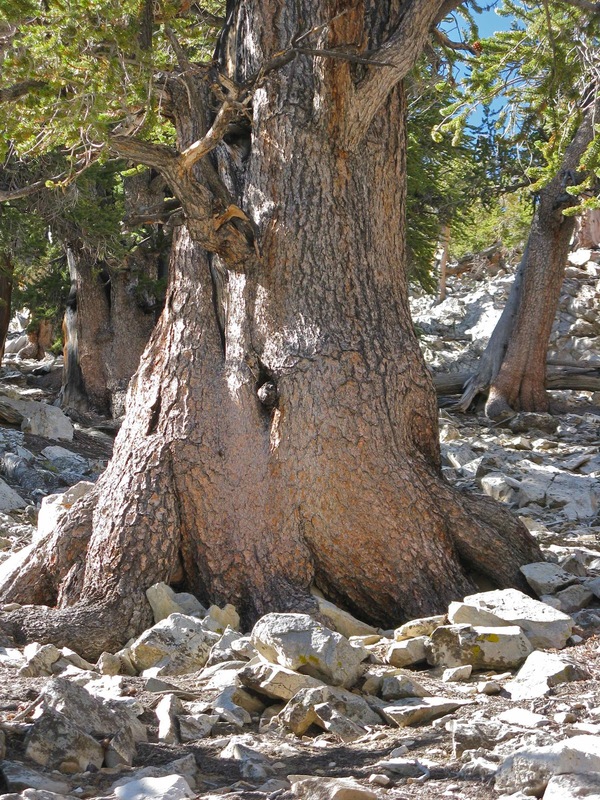 The small portion of an ancient tree that is still alive continues to grow with youthful vigor, producing healthy bark, needles and cones. Even its DNA shows no sign of deterioration. The seeds are viable, with no increase in mutation rate. 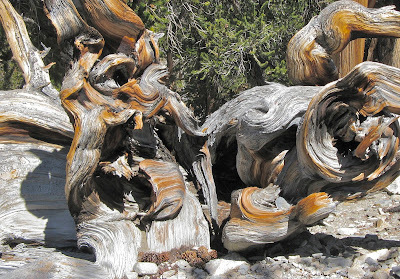 Shortening of chromosomes, seen with aging in so many organisms, doesn’t happen in bristlecones. Can we really call these trees "old"? This ancient tree may be mostly dead, but what remains is still young! Schulman, Edmund. 1958. Bristlecone pine, oldest known living thing. National Geographic 113:354-372. Lanner, Ronald M. 2007. 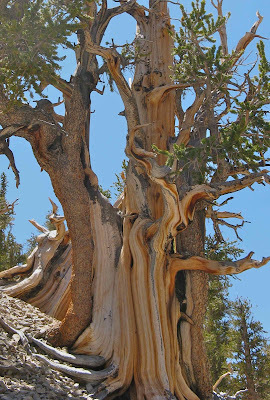 The bristlecone book; a natural history of the world’s oldest trees. Missoula, MT: Mountain Press Publishing Co. The Ancient Bristlecone Pine Forest, in the White Mountains of California, is managed by Inyo National Forest and the Eastern Sierra Interpretive Association. I wrote about the Great Basin bristlecone and other members of the Foxtail Pine group in an earlier post, Ancient Plants on Ancient Rocks. En route to the Black Hills, 1874. Photo by Wm. 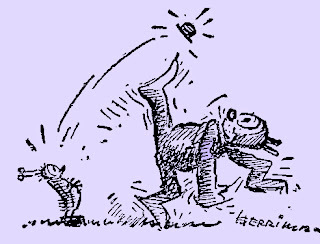 H. Illingworth, from Wyoming Tales and Trails. Marching through a Black Hills mountain meadow. Photo by Wm. H. Illingworth. 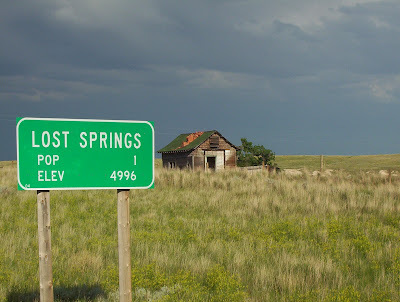 Now, in late July of 2012, I’m off on my own expedition to the Black Hills, traveling across the “dry and woodless country” of eastern Wyoming. Fortunately I’m not walking, and the trip should take only six hours. 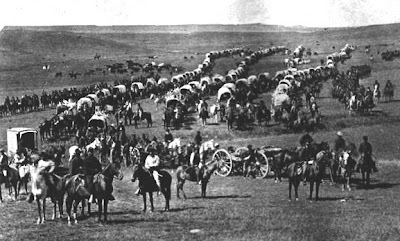 This is an expedition in search of the luxuriant mountain meadows that so enchanted Custer’s weary soldiers 138 years ago. Unfortunately, we’re unlikely to find many. 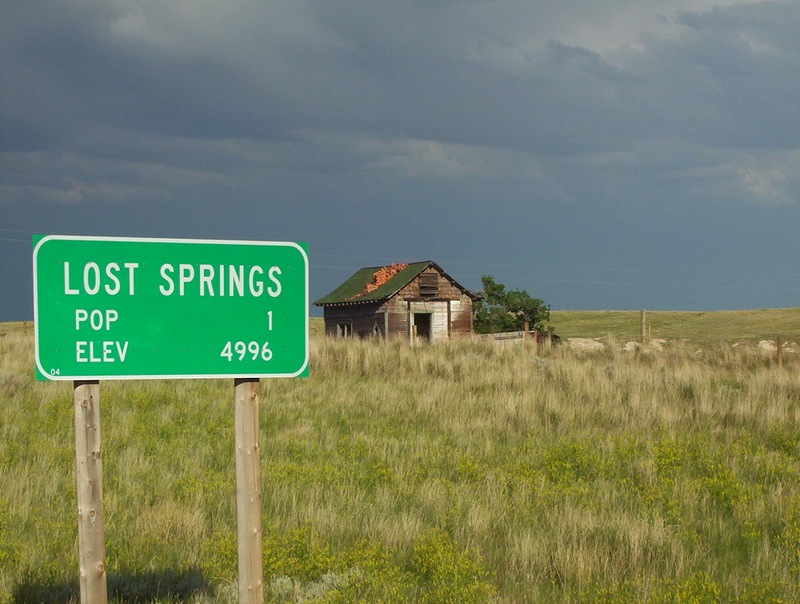 En route to the Black Hills, 2012; Lost Springs is the rest stop halfway. Photo courtesy Idunno00923. 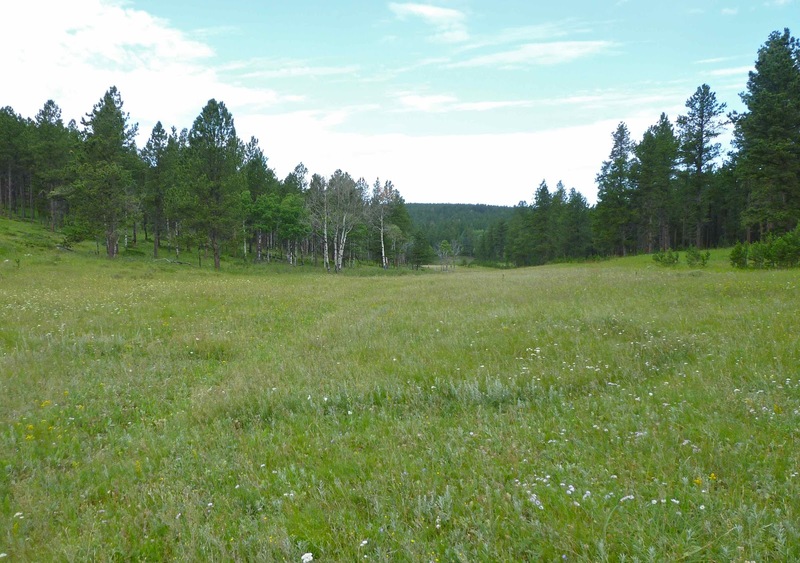 Last summer, we did a comprehensive inventory of mountain meadows in the Black Hills of South Dakota. We assessed grassland quality based on species composition (native vs. non-native) and degree of disturbance. 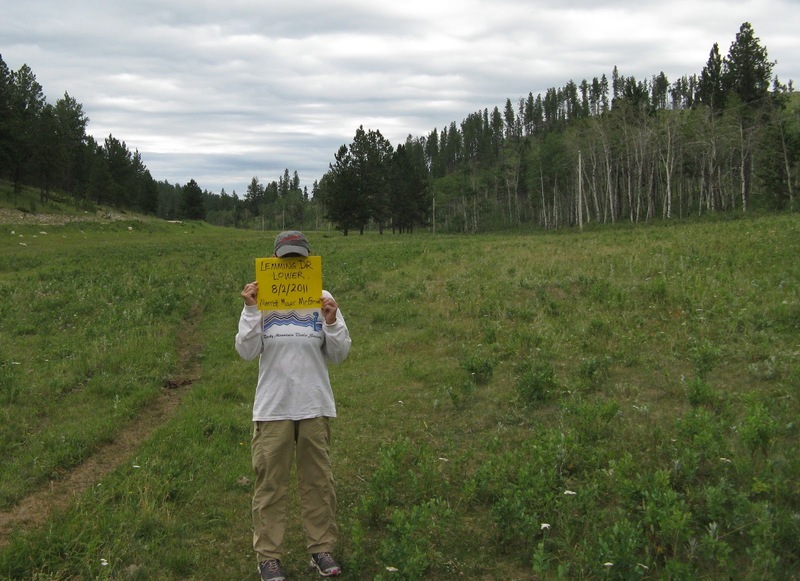 Of the 78 high meadows surveyed, only eight were ranked A or B! All are located in dry drainages in the southern part of the Limestone Plateau in the western Black Hills. 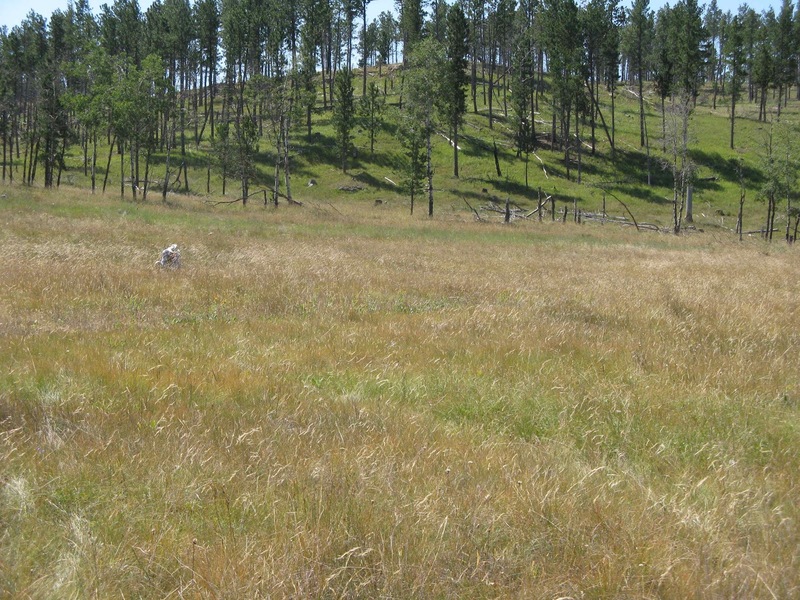 Further north, small relic patches of native grassland sometimes are found on lower slopes, but the lush meadows in drainage bottoms that were described by Custer and Donaldson in 1874 now are mostly non-native hay grasses -- timothy and smooth brome. We don’t know their original composition; even by the time of the first botanical studies in the 1920s, they were largely taken over by timothy. 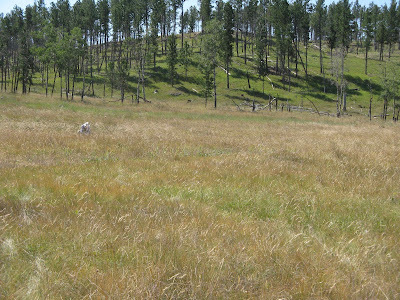 Native Black Hills montane grassland in Redbird Canyon; note fairy ring. Photo by Helen McGranahan (Black Hills National Forest). 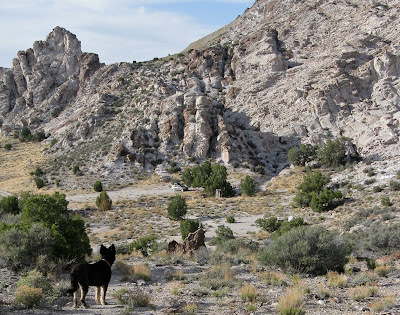 Assessing a high-ranking grassland in West Hell Canyon. Black Hills montane grasslands are an interesting mix of grasses, in keeping with the “botanical crossroads” nature of the Black Hills. Richardson’s needlegrass is a northern and Rocky Mountain species. Timber oatgrass grows from southeastern-most Russia across Canada and south through much of the western US. Shortbristle needle and thread is a northern species found only as far south as the Black Hills. 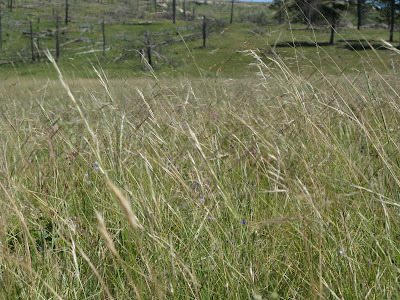 Prairie dropseed grows mainly in the Midwest; it is near its western limit in the Black Hills (Barkworth et al. 2012). Native grasses in upper Gillette Canyon. 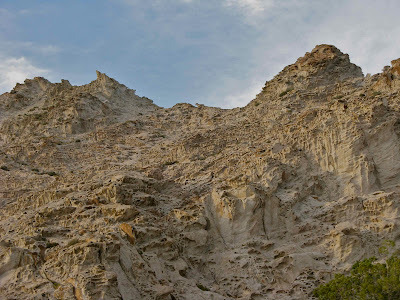 The Black Hills of Dakota ... and Wyoming (click to view). 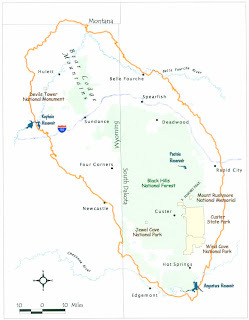 The 2011 surveys provide only part of a comprehensive picture of Black Hills mountain meadows -- the part in South Dakota. Contrary to popular opinion, a sizable portion of the “Black Hills of Dakota” is located in Wyoming. 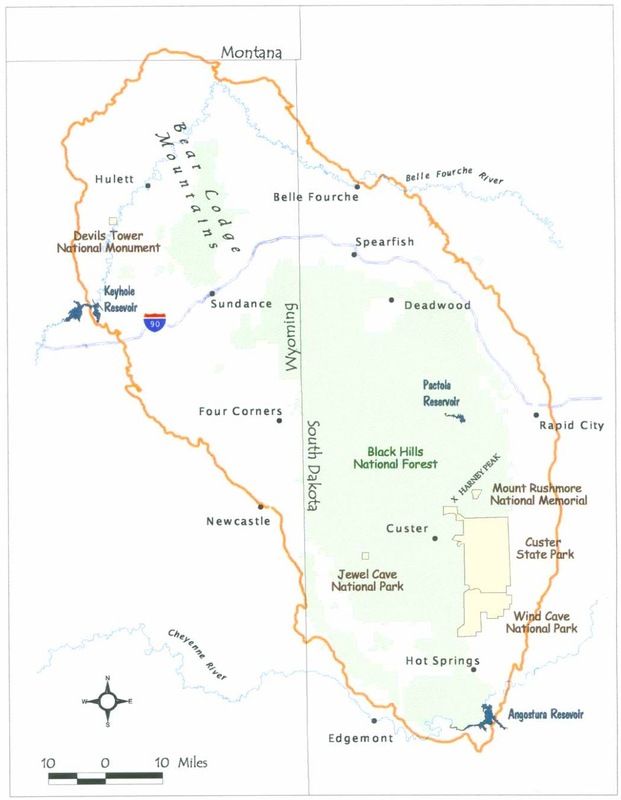 In 2012, Black Hills National Forest is funding montane grassland inventory in northeastern Wyoming, to complete the picture. 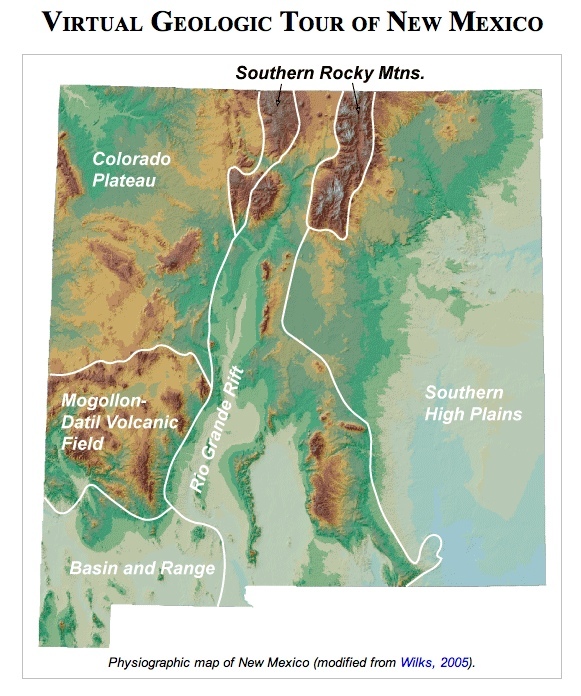 The Limestone Plateau, habitat for Black Hills montane grasslands in South Dakota, continues into northeastern Wyoming, and much of our effort will be in that area. Based on what we saw in 2011, these meadows probably will be mostly hay grass. 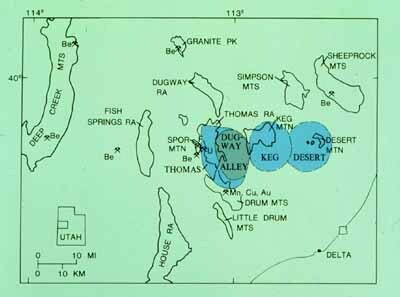 But there are several other high-elevation sites of interest, underlain by igneous rock emplaced late in the uplift of the Black Hills (Paleocene, Eocene times). 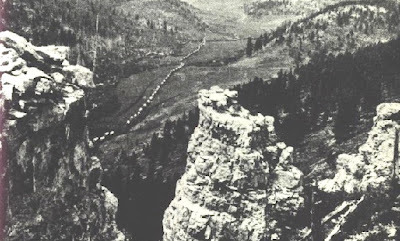 An intrusion in the Bear Lodge Mountains in the northwest Black Hills includes a huge block of Precambrian granite that forms a series of bald summits called Warren Peaks. Reconnaissance in 1998 suggested these grasslands are similar to those of the Limestone Plateau but not quite the same. I'm curious. What mix of species will we find? Will they be native? Whatever it is that grows on Warren Peaks, it won’t be there much longer. Rare Element Resources reports that the crest of the southern Bear Lodge Mountains “contains one of the largest disseminated rare-earth element (REE) deposits in North America as well as extensive gold occurrences. 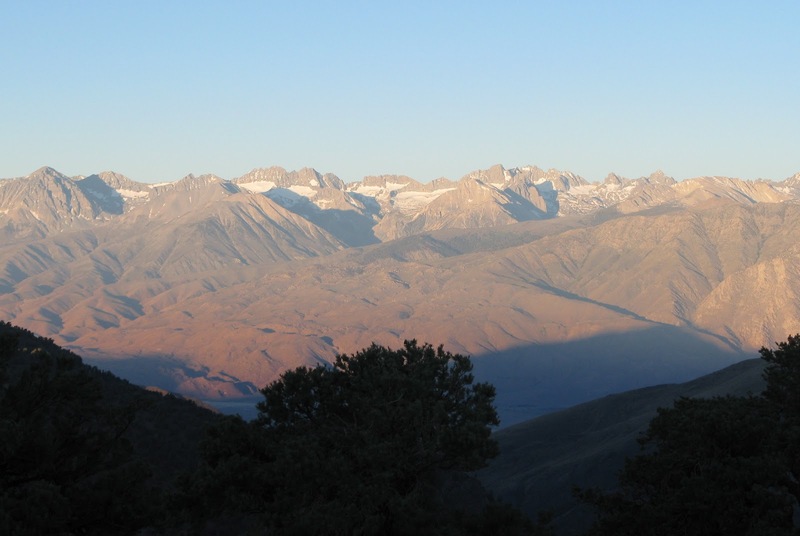 The Bear Lodge Project has high-grade light REE and significant quantities of heavy REEs, favorable metallurgy, outstanding infrastructure, and it is located in one of the world's best mining jurisdictions [i.e. 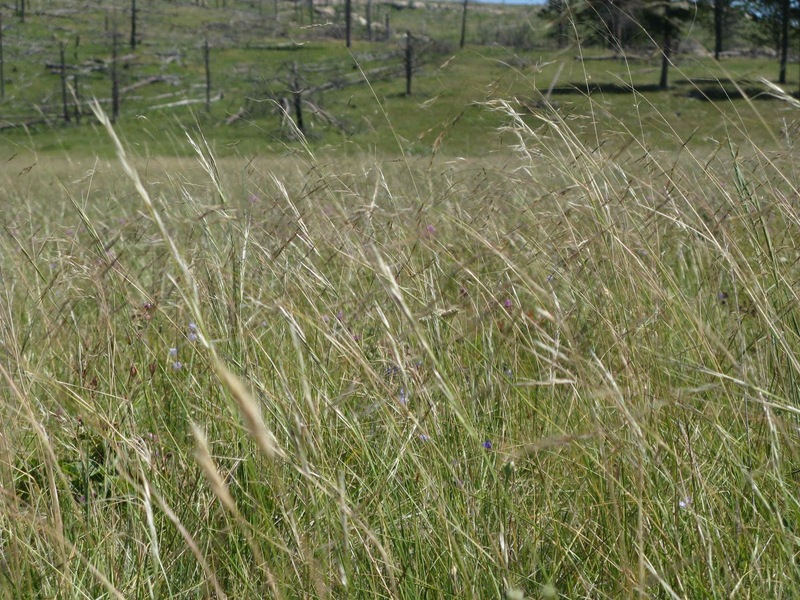 the State of Wyoming], recently globally ranked fourth by the Fraser Institute.” So it goes ... more change is in store for Black Hills montane grasslands. 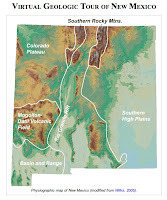 (map by Rare Element Resources, Ltd; click to view). 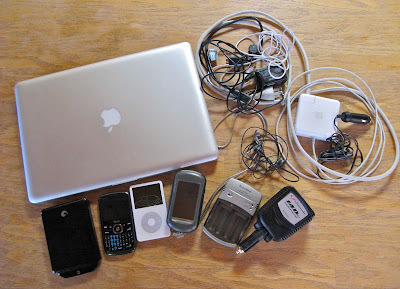 In the Company of Plants and Rocks will be inactive while in the field. 1. 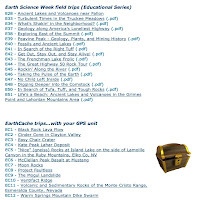 Pick destinations from one of the many great geo-tripping resources online. 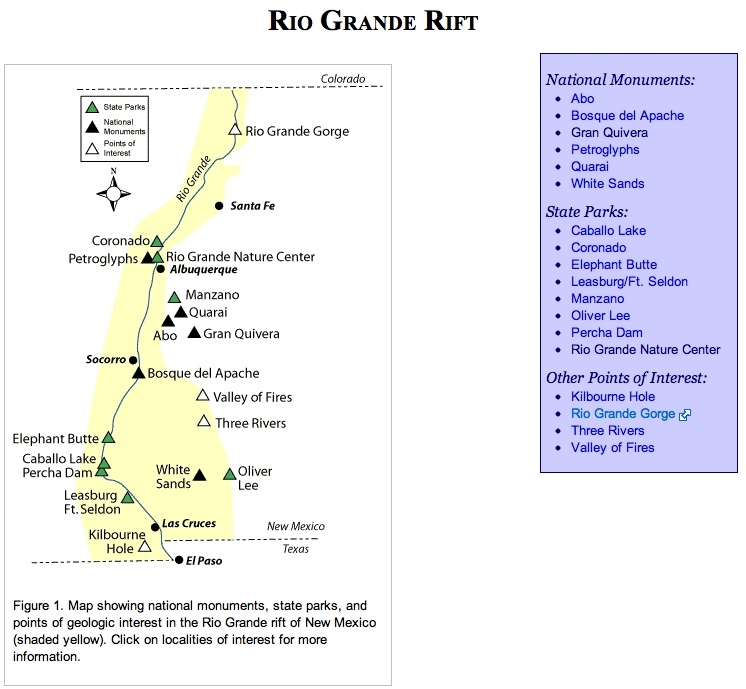 The first that I discovered was the Virtual Geologic Tour of New Mexico by the New Mexico Bureau of Geology and Mineral Resources. Pick a region, and you get a map with geo-destinations (example below). 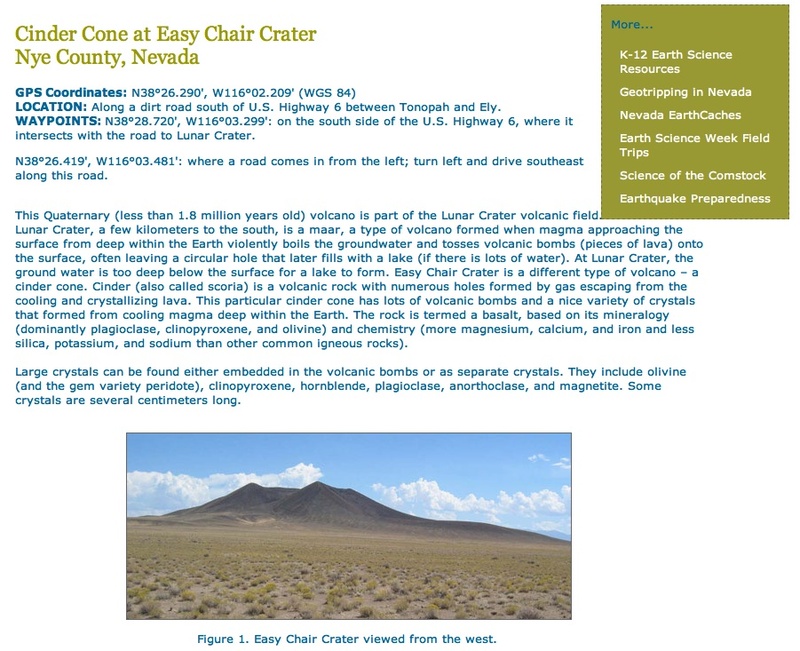 Another click will bring up an article about the geology of a site, usually with a map, stratigraphic column and photos. 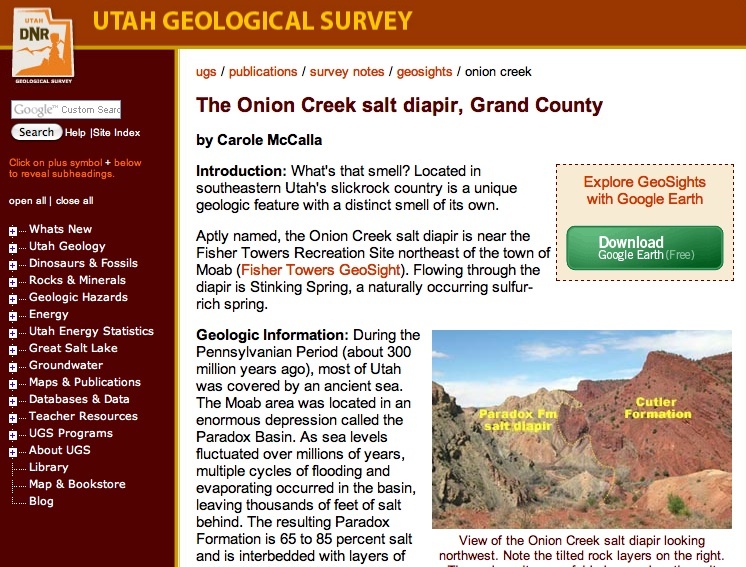 The Utah Geological Survey has a great website called Geosights. 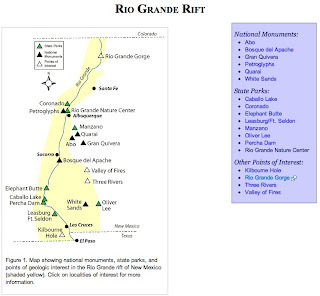 Click on a geo-destination on the index map (right, click to view) for an interesting and informative writeup (example below). 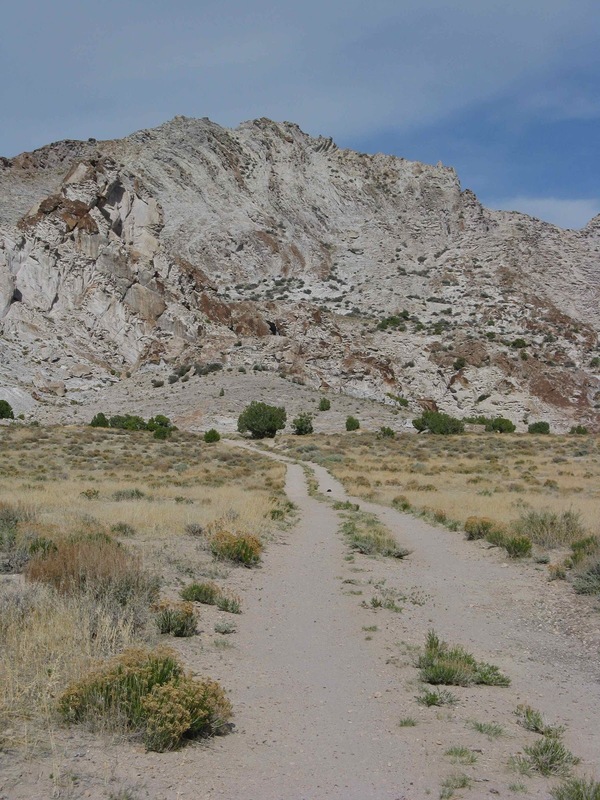 Geotripping in Nevada is maintained by the Nevada Bureau of Mines and Geology. You can visit exciting places without going far from home. Well ... that really wasn’t what I had in mind. Click on links and start planning your next adventure! Ah, yes, that’s more like it. 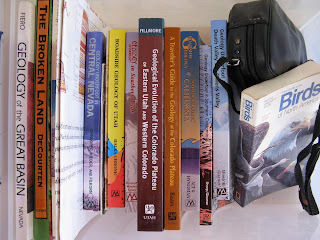 Left: ideas for Nevada geotrips, click to view. 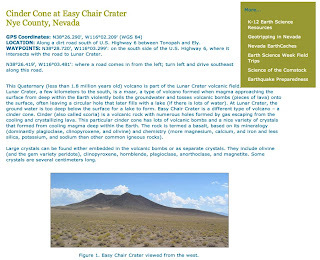 Below: planning a trip to Easy Chair Crater, courtesy NBMG. I have relied on several geo-blogs for planning as well. At Looking for Detachment, posts are tagged by highway among other things (right; click to view). 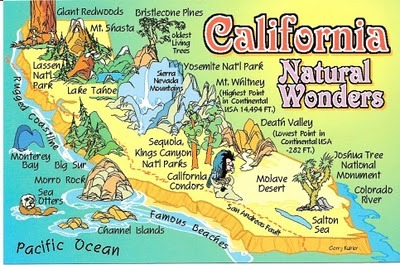 Geotripper’s The Other California: What to See When You've Run Out of Postcard Destinations, is another good source of ideas (below; postcard by Scope Enterprises, Inc.). 2. Download literature to laptop. Maybe take some books along too ... just a few. 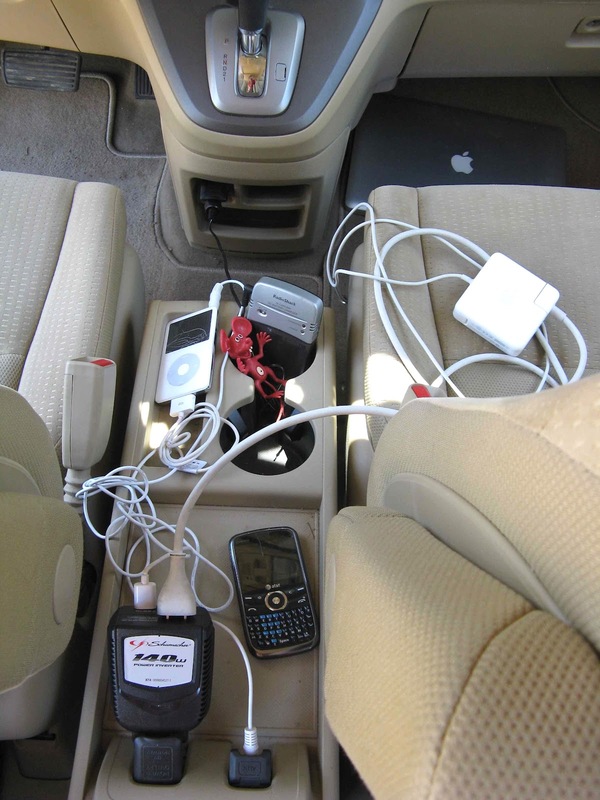 That would be a computer, backup drive, cell phone, updated iPod, GPS, battery charger, various cables and a power inverter. And a camera of course! I found the inverter (lower right in photo), the final and critical part of this system, just before departure last April. Figuring out what I needed turned out to be a major hassle, and then the solution was soooo easy, courtesy Walmart. And it all worked great! Evening in the Fisher Valley, Utah. 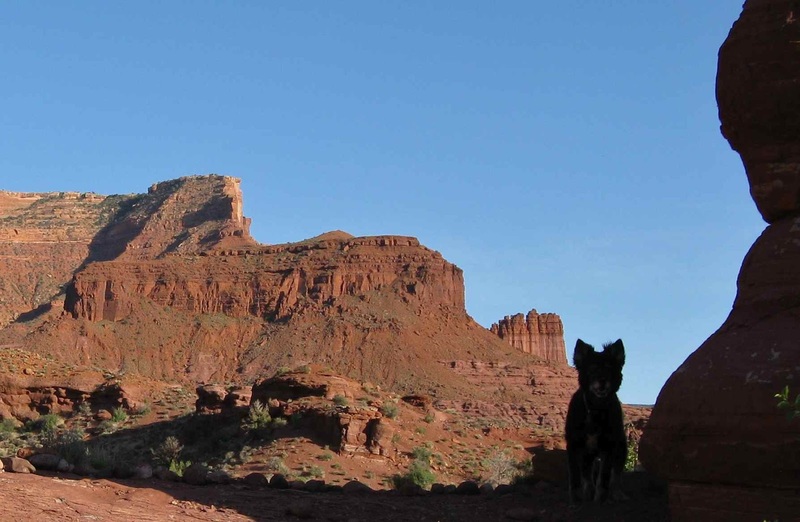 Evening at the San Rafael Swell, Utah. Early morning light on the high Sierra; from the White Mountains, California. 5. ... and don't forget to write! 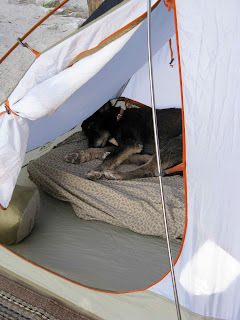 The hardest part about blogging on the road is taking time off from wandering to write. I hope to do more next time. Is that mantle on the mantle? This is the Weiss Highway. 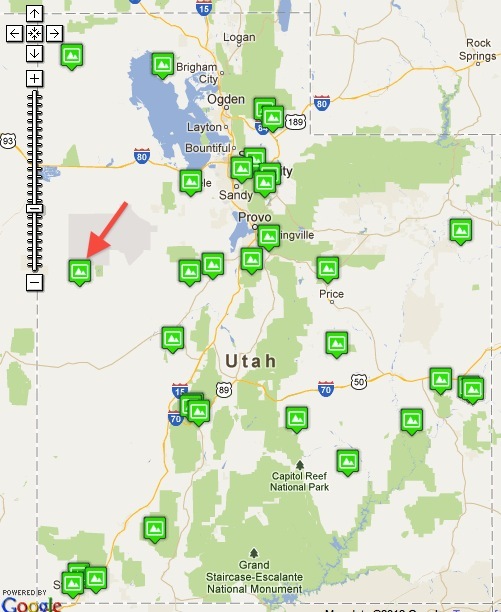 I was on it in late April, at the recommendation of the Utah Geological Survey. 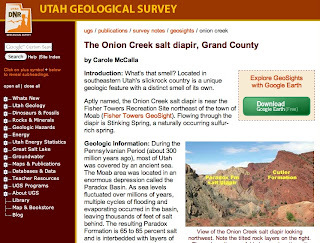 The UGS's great Geosights webpage. 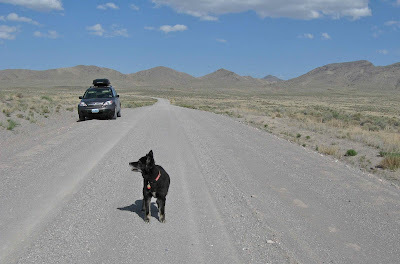 The Weiss Highway is one of those well-maintained gravel roads that cross the basins and ranges of western Utah and much of Nevada. About 30 miles west of Utah State Route 174, and roughly 25 air miles east of Nevada, there are some low hills just east of the highway -- the Honeycombs. A dirt two-track leads to the base of the rocks. No wonder these hills are called the Honeycombs! 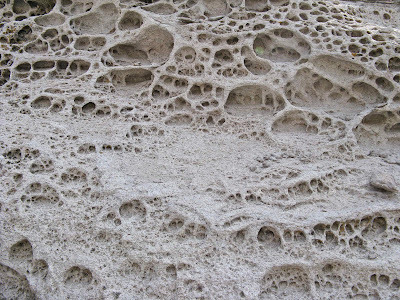 They are quite riddled with tafoni -- natural cavities. 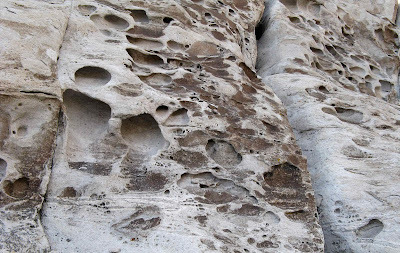 The tafoni are so dense and close together in places that they resemble the cellular structure of beehives, hence the term “honeycomb weathering”. Other names are lace rock, stone fretwork and stone lattice. 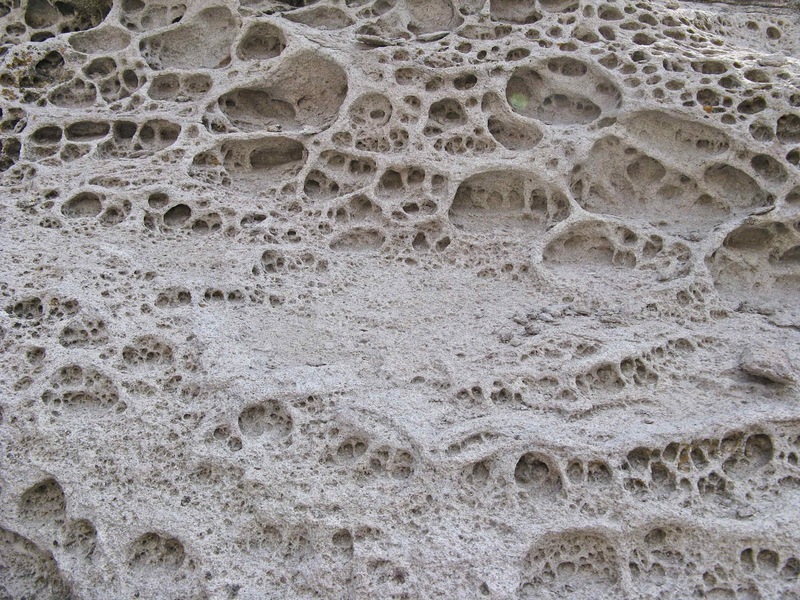 There are tafoni of all shapes and sizes, and tafoni within tafoni. 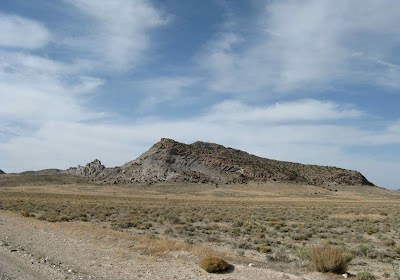 The rock is rhyolite, the remains of a 4.7 million-year-old lava dome. 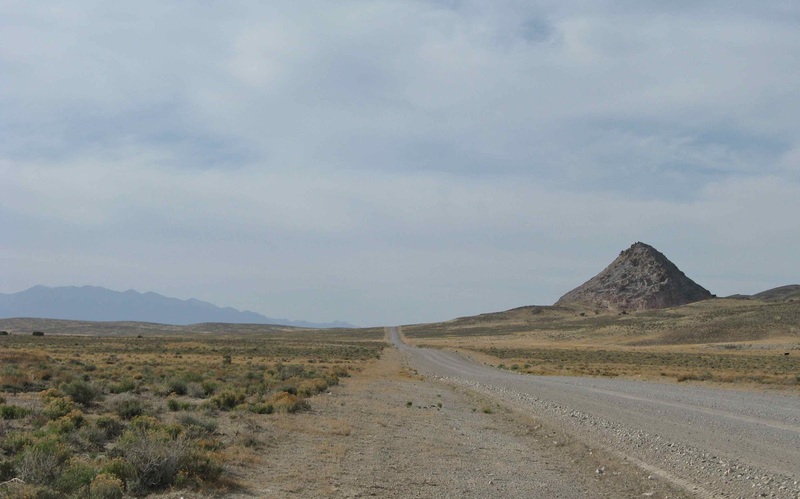 The rhyolite dome sits on top of a 40-foot layer of volcanic tuff (consolidated ash), produced in early explosive stages of the volcano. 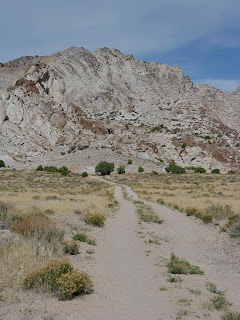 The rhyolite was deposited later, as lava flows. This volcano is one of the younger ones of the beryllium belt of western Utah, aka Deep Creek--Tintic belt (below; courtesy US Geological Survey). Remains of the volcano's main magma conduit are obvious in places. 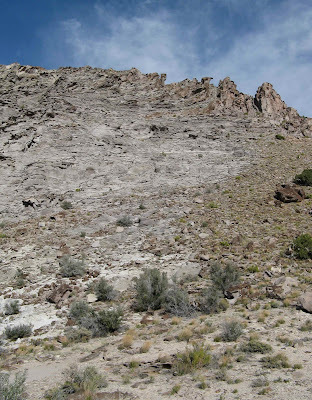 Note flow-banding in rock near top of slope in photo below. 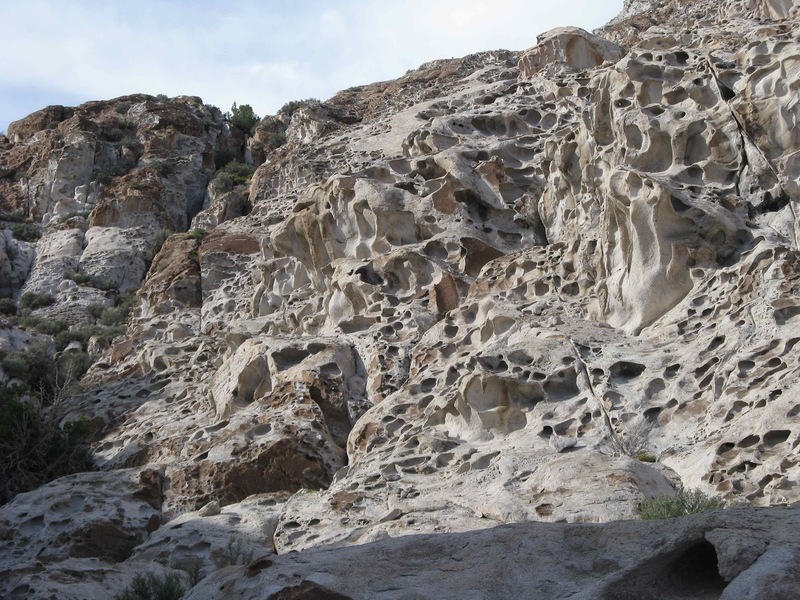 The rhyolite of the Honeycombs is enriched in beryllium, fluorine, uranium, tin, rubidium, thorium, cesium, yttrium and lithium. 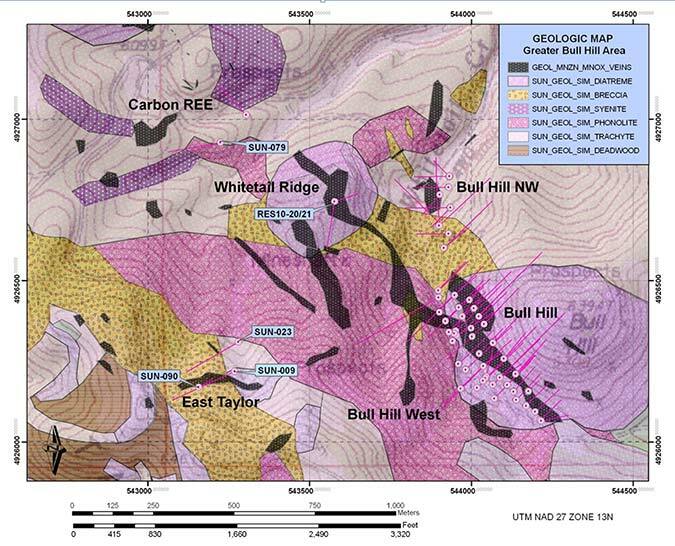 There has been active exploration for beryllium and uranium in the area since the early 1960s, and all claims are now owned by Redhill Resources Corp., which mines gold and rare earths. 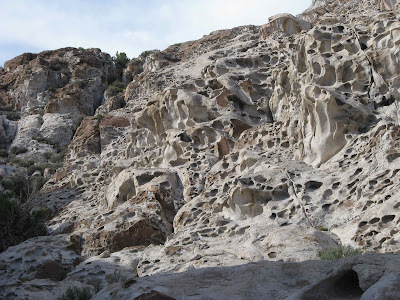 The Honeycombs also are a public community pit for collecting lace rock for aquaria. As much as we need rare earth minerals, it would be a shame to lose the Honeycombs. I have such wonderful memories of my time there and would love to go back. After wandering around among the tafoni, I set up camp in the surreal landscape, built a small fire of juniper branches, and watched the sun set and evening come. A canyon wren called, an occasional cow mooed in the distance, and a gopher snake crossed the wash. It is difficult to recreate that evening in the Honeycombs now that I’ve been back in civilization for over two months, immersed in busy-ness and sound. But I try to do it anyway ... to remember the peaceful evening in the west Utah desert, surrounded by remarkable sculptures made of rock and holes-in-rock. 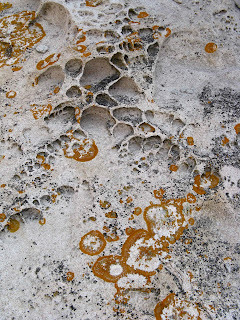 This is the final post of my tafoni series. 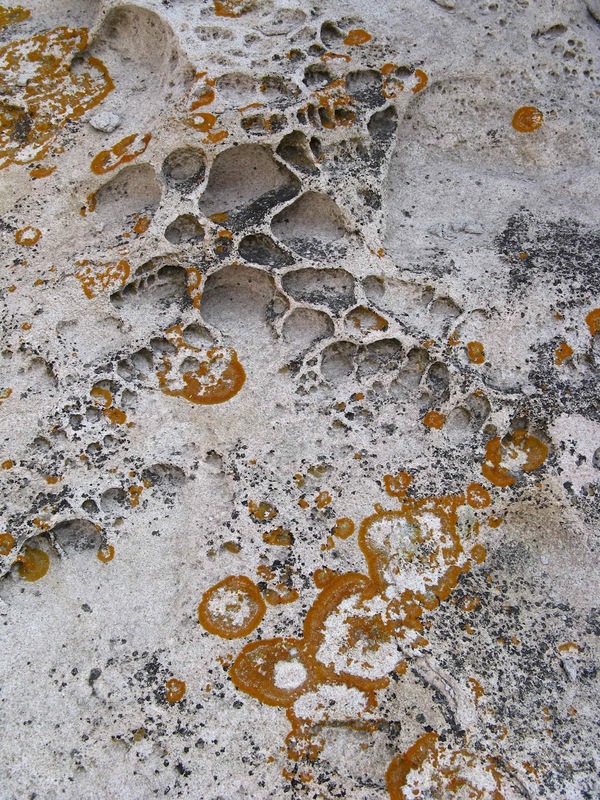 The others are tafoni #1, #2 and #3. What’s an old oak for?